These pipes for smoking bees are from Karl Fritz in Germany. The pumping spout at right is from Lega in Italy. 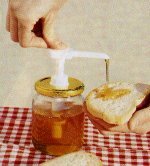 This mobile apiary is from Slovenia, host of the upcoming Apimondia conference in 2003. The entrance guard is intended to let bees into a hive, but not out. It might be useful when moving a hive when bees are flying. This version is from Lega in Italy. 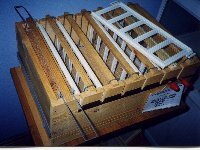 This half-length frame super is intended for drawing out and storing comb for mating nucs, but might also be good for large comb sections. This one is from Yazbek & Sons from Lebanon. The venom collector at right is for collecting medicinal venom. It uses electricity to cause bees to sting glass plates. 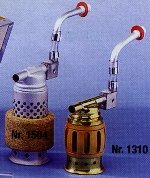 This specific item is from Ukraine, but a similar device was demonstrated at Apimondia '99. 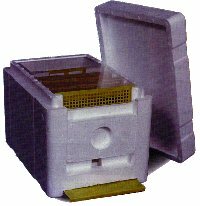 Plastic hives and nuc boxes are available from several manufacturers. The quality reputation of plastic hives seems to be improving. Most earlier products tended to warp, break and get chewed by bees. 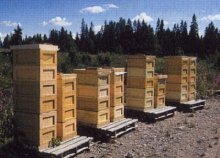 The hive at left is from Nordic Beekeeping in Finland. The hive at right is from Apiculture Centre in Nepal. Plastics, plastics, .... from Nepal (left) and Germany. Traditional hives are also being sold. This long hive, or trough hive, is available from Swienty A/S in Denmark. Less heavy lifting with this hive! This British WBC hive is a novelty from E. H. Thorne in the UK, where hive design standardization is less apparent than in North America. 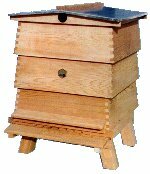 This observation hive (right) is from Lega in Italy, and looks very similar to Langstroth's hive from the 1800's. Beekeeping technology is still evolving!